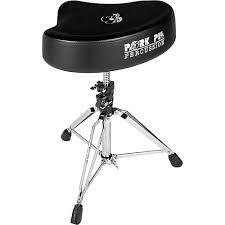 Choosing the best drum throne for back pain can be one of the best investments you make as a drummer. 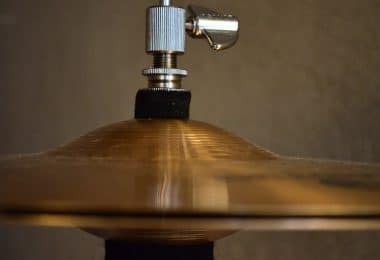 Lower back pain and leg numbness are all too common for drummers, so in this guide I’ll show you some options for relieving your pain and extending your drumming career. I think that back pain from drumming is a more common problem than most people think. 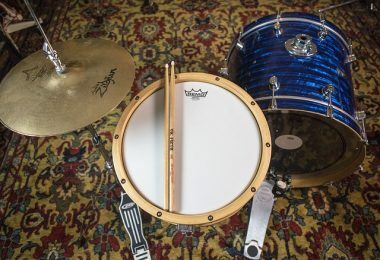 It drives me crazy when I see people spending thousands of dollars on all their drum gear but then they continue to use a cheap $20 drum throne that came with their drum set. In order to extend the life of your drumming hobby or career, you’ll definitely want to invest in a quality drum throne. 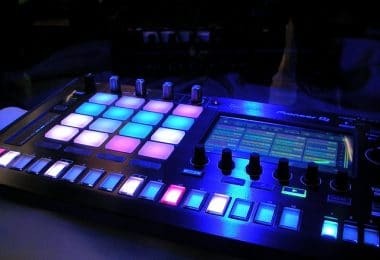 If you play for hours at a time or plan on gigging sometime, it’s an essential purchase. I’ll go into much more detail down below for all the options, but to sum it up my favorite drum throne for back pain is the Roc-n-Soc Nitro. In life there are a few specific things that I think it’s worth spending a bit of extra money on. These are things like a good mattress, pillow, comfortable shoes, and toilet paper - The kind of stuff that will make a difference in your quality of life. 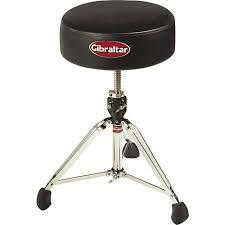 In the drumming world, this equates to the drum throne. 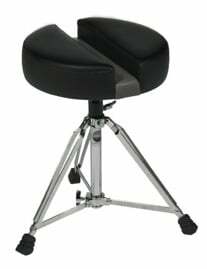 When looking at the best drum throne for back pain options down below, keep in mind that for most you can buy a separate back rest from the same manufacturer for added support. 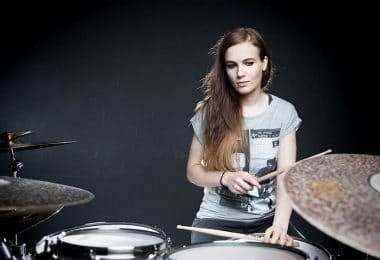 Fix Your Drumming Posture First! Before we get into the different drum thrones for people with back problems, it’s important to make sure you have a good posture that isn’t doing any harm to your spine. No matter what you sit on, if you are slouching over you’ll continue to experience stress in your lower back no matter what. The first order of business is making sure you are sitting at the correct height. The throne height should be at a point where your legs form a 90 degree angle. Make sure your upper legs are parallel to the floor. If you put too much weight going forward or back on the seat, it’s going to put a lot of pressure on your lower back. The whole goal is to evenly distribute your force so it’s important to find a good neutral starting position. When you lean back too much on your drum throne, your whole pelvic system will enter a posterior pelvic tilt which will lead to lower back tension. This is when your pelvic rotates backwards and your spine ends up in a curved shape. Similarly, when you lean forward too much to get over top of the pedals or read sheet music you will enter anterior pelvic tilt where your pelvis will rotate forward and force your spine to curve. Two things happen in the latter. One is that you will experience tension in your lower back, and the 2nd is that you’ll cut down on your hip flexion. This means that since your pelvis is rotate forward, you won’t be able to lift your legs up as high which will affect your bass drum playing negatively. Once you have good posture squared away, the next step is to look for a high quality drum throne designed specifically for helping relieve back pain. Let’s take a look at some good options out there on the market. Roc-n-Soc has been around for quite a while in the drum throne world and they are masters of innovation. In 1987, they became the first company to offer a motion throne. Shortly after they created the world first sculptured seat and embroidered cloth seats. Eventually, they created the industry’s first successful tri-pod gas-shock throne along with a smooth swivel seat, among many other things. The Roc-n-Soc Nitro Throne is compact and offers a built-in nitrogen gas shock absorber for extra bounce and comfort. In addition to the extra bounce, the gas shocks absorb some of the shock from playing and takes pressure off of your hips and lower back. 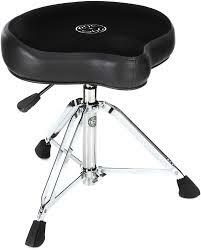 The way that the top of the drum thrones is shaped also helps prevent leg fatigue which makes it easy to sit and play for hours on end without cramping or stiffness. The gas lift makes adjusting the height of this seat very easy. You can buy the Roc-n-Soc with or without a backrest, or you can pick up the backrest separately afterwards if you think you need it. Dan Carmichael played drums as a hobby and professionally, and like a lot of us experienced lower back fatigue and pain from playing for long periods of time. He eventually acquired an over-use injury to his tailbone and lower spine which made it unbearable to play. After a bunch of trial and error, Dan realized that he could relieve a lot of pressure on his spine by removing the middle section of the drum throne. Removing this middle section allows the spine to “float” which takes a lot of the pressure off of the spinal disks in addition to reducing stress on your hip joints. As the story goes, Dan created an office chair and drum throne for himself using this philosophy. After somebody working on his home inquired about it, he lent the drum throne to a family member of theirs who suffered from chronic back pain and leg numbness following a fall at work. After using it every day for 1 month, she noted a 75% reduction in pain, the tingling and numbness in her legs was reduced drastically and she was able to reduce the amount of pain medication she was taking. After that Dan began creating his chairs to share with others, and the rest is history. Some of the problems listed on their website that this product aims to fix is lower back, sciatica, tailbone, coccyx, degenerating disc, sacrum, prostate and pelvic pain relief. The DW 9000 features pneumatic height adjustment for easy positioning. The best part about this throne is that it’s rock-steady. A lot of other thrones out there move around ever so slightly, but this one gives you a solid foundation and a sturdy quad-leg folding base. 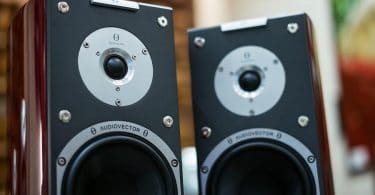 It features a largely oversized base which is perfect if you tend to be on the bigger side. Since it’s on the heavier side as far as weight goes, it’s not ideal for traveling with. However, having such a heavy-duty and sturdy throne in your studio is great because you know it’s not going to budge or break on you. 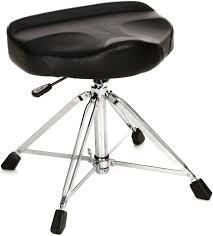 Like most of the other drum thrones on this list you can purchase a back rest separately if needed. There is also a small round drum throne with the same airlift technology available if you prefer a smaller circular seat over the tractor style. Comfort should be the highest priority when searching for a drum throne. How you feel directly translates to your playing, so if you feel good you will usually play well. In addition to this, if you have a great looking drumkit, why ruin that with a cheap looking drum throne? The Gibralter Softy fixes both of these issues. It features a nice thick 5” cushion with an outer layer of plush Cordura fabric. A lot of the magic comes from the base on this throne. It features a tripod leg style that is double braced. 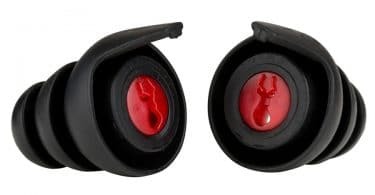 The leg base lock is lined with a nylon bushing so that there is no metal-to-metal contact when you tighten the wingnut. This means that it will stay locked in place and it won’t damage the bottom of the post. The top of the post features a memory lock so it can memorize the height of your preference. The seat has a high density foam that provides the support your back needs and it’s very comfortable. This is the round-top version, but larger players out there can opt for the tractor-style seat with leg cutouts. In addition to all of this, you can purchase a universal Gibralter back rest that will clamp on to this with ease if you prefer the added support. 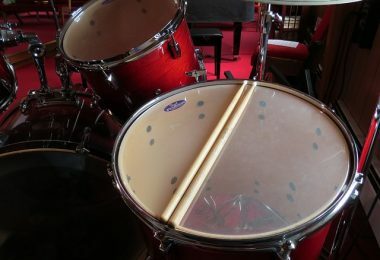 In 1987, Bill Detamore started making drums as a hobby out of his garage. After a lot of demand he ended up turning it into a full fledged company, and there have been no signs of slowing down since then. All Pork Pie drums are hand-crafted in Canoga Park, California. The Pork Pie Tractor Style Throne is geared more towards the bigger drummers out there, although it can work for anybody. It’s a highly rated comfortable throne and the featured leg cutouts provide extra hip-joint relief. One of the great things about this drum throne is that it’s silent when turning, unlike most other thrones that squeak as you move around. This is especially great for when you are trying to record drums. Download our FREE Drum Practice Pack!